Vote for us before midnight tonight! PEDAL’s Organic Market is 9.30−1.30 this Saturday (see below) , and Eva and I tied the bright Organic Market ban­ners to the fences out­side Towerbank Primary School this morn­ing while the sun was shin­ing. Then we put up the Turbine dis­play and our rough and ready Turbine posters, and gave out leaf­lets to scores of mums and dads — ask­ing people to register sup­port for our tur­bine pro­ject before mid­night tonight by click­ing on the big blue “Support this group” but­ton on the Energyshare web­site so we can have a chance of secur­ing fund­ing. The response was great and anoth­er 30 folk have signed up in the hour and a half since. At the moment we’re at 4th out of 926 pro­jects, and Energyshare want to know “Who’s the most pop­u­lar of them all?”, so for them our pos­i­tion will sig­ni­fic­antly impact on wheth­er they fund us. As far as PEDAL’s con­cerned, how­ever, although we want the fund­ing this is also an oppor­tun­ity to get our mes­sage across, to get people to think and talk about what we as a com­munity can do to make this an even bet­ter place to live. Two con­cerns people have are flick­er and noise (addressed in the leaf­let we were hand­ing out). Our con­sult­ant has informed us that flick­er will only be a prob­lem for a few very nearby houses for a few hours in the early morn­ing each year, and we can reduce the tur­bine speed at that time to solve the prob­lem. As for noise, you can appar­ently have a con­ver­sa­tion dir­ectly beneath the tur­bine without rais­ing your voice, more than can be said for the Seafield Road! 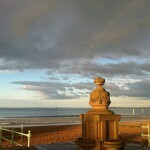 Portobello Beach — it’s always almost sunny here! This entry was posted in Wind Turbine. Bookmark the permalink.